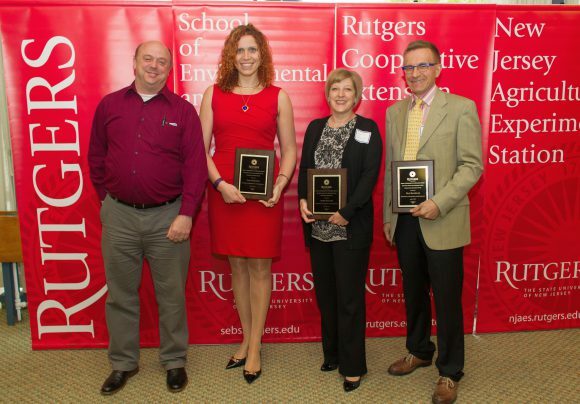 Share the post "A Celebration of Excellence 2017"
Some of the 2017 Excellence Award Winners: Jason Grabosky, Yana Bromberg, Jessie Maguire, and Max Häggblom. Photo by Eric Gautier. 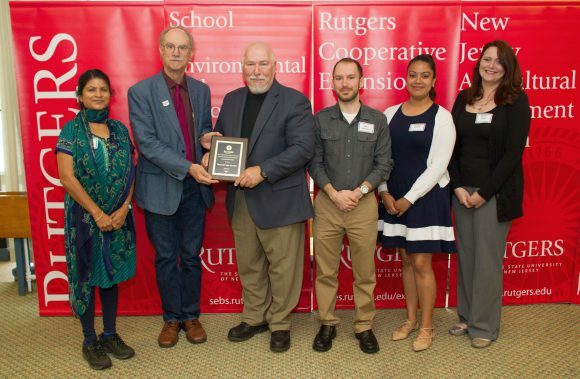 On April 25, faculty, staff, and students attended the 24th annual Celebration of Excellence for the School of Environmental and Biological Sciences and the New Jersey Agricultural Experiment Station held at Neilson Dining Hall. According to executive dean Bob Goodman, this signature event acknowledges contributions that meet carefully-considered criteria, including creativity, original work and ideas, innovation, effectiveness, integrity, leadership, impact, community engagement, and excellence. The awards were presented by dean of academic programs, Rick Ludescher. 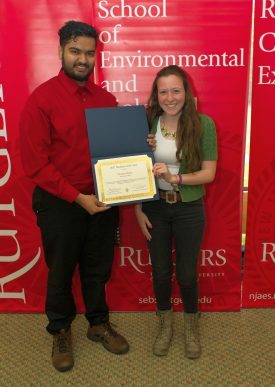 SEBS student Pushpadantgiri Goswami also presented the Alpha Zeta Honor Society Awards at the event. Following are the Excellence Award recipients along with excerpts from dean Ludescher’s presentation. Dean Rick Ludescher presents Jason Grabosky with the Teaching Excellence Award. Jason loves trees. I mean really loves trees. He loves to hang out under them. To study them. To even cut them with chain saws when they need it. But perhaps most of all, he loves to teach students about trees. And he does it very well. He strives to encourage student learning and nurture enthusiasm through his immersive teaching strategies. He demonstrates an enthusiastic dedication to undergraduate education through a number of creative and unique course offerings, not only about trees. He has developed an honors course about intellectual creativity, for example, in which students learn not only how to ask questions, but also how to develop a novel idea from a pie-in-the-sky concept all the way to filing a patent disclosure. But he does more than just teach. 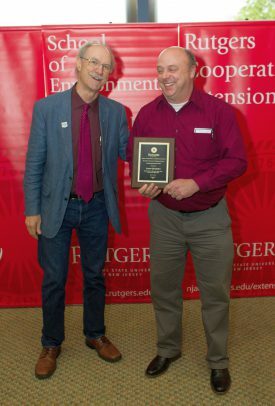 He is director of the School’s General Honors Program and the creator of the new Center for Resilient Landscapes, a cutting-edge initiative focused on the development of social-ecological system resilience. In addition to encouraging research and developing courses to support urban and rural natural resource stewardship, the center connects students to state and federal government job opportunities. For his enthusiasm for and excellence in undergraduate education, we are honored to name Jason Grobosky as the 2017 Teaching Excellence Award winner. 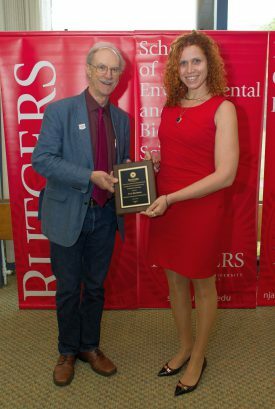 Yana Bromberg with the Research Excellence Award. As we all know, the world is awash with data, literally drowning in facts. Yana Bromberg is recognized by her peers throughout the world as a leader in bioinformatics and computational biology, a field which develops methods and tools to turn these data not only into useful information but into scientific knowledge. Her work analyzes large data sets of genome and protein sequences from which she gleans insights into genome organization, evolutionary relationships, protein functions, and disease processes. Her scholarship has attracted national and international attention and recognition, resulting in many invited talks both in the U.S. and abroad and invitations to give keynote addresses at major scientific meetings. Her research is funded by the PhRMA Foundation and the NIH, by a Hans Fischer Outstanding Early Career Scientist Fellowship and by a prestigious NSF Career Award. As an emerging star in the field of bioinformatics, we are proud to present Yana Bromberg with the 2017 Research Excellence Award. Max Häggblom with the International Excellence Award. Max obviously likes to travel. Born in Finland and now living in New York City, he not only commutes every day to work but also regularly travels the world to research and to teach. As one of the world’s foremost experts on environmental microbiology, he has since 2001 led an international research team focused on Arctic microbial ecology. He has been a visiting professor at the Chinese Academy of Science and at the Forest Research Institute in Finland. He initiated the first International Conference on Polar and Alpine Microbiology and has served on the Organizing Committees and Scientific Boards for all subsequent meetings. As the chief editor of the journal FEMS Microbiology Ecology, he leads an international team of editors. In the last two decades, he has published more than 50 papers with international collaborators. Max has taught courses in Finland, India, China, Germany, Italy, Peru, and Vietnam; he is currently a US-Faculty Scholar for the Vietnam Education Foundation and was appointed a US-Indo Professor by the American Society for Microbiology. And he has earned the admiration and jealousy of all his faculty colleagues, as well as the thanks of many Food Science students, for convincing the School to send him to the south of France every spring to offer the course Microbiology and Culture of Cheese and Wine. For his energy and his enthusiasm for international research and education, we are pleased to honor Max Häggblom with the 2017 International Excellence Award. Jessie Maguire with the Staff Excellence Award. Jessie Maguire, as the business assistant in Biochemistry and Microbiology, is essentially the fiscal officer of her department. 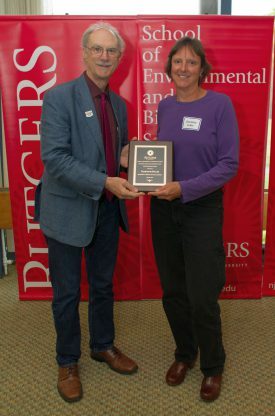 On the staff at Rutgers since 1995, she fulfills these responsibilities in an outgoing and collaborative manner, quietly and effectively guiding faculty and students through the maze of financial protocols at Rutgers. She has been particularly resourceful in solving the many and particular problems of international students. Her ability to learn on the job is superb; she has a reputation of getting things done quickly and well and is widely considered to be the “go-to” resource person in the department. She clearly goes well beyond the routine demands of her job and continually contributes to a positive, collaborative work environment. 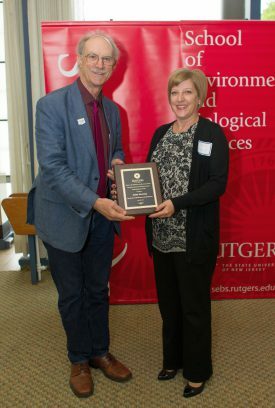 For her exemplary service to the Department, to the School and to Rutgers we are pleased to honor her with a 2017 Staff Excellence Award. Charlotte Fuller with the Staff Excellence Award. Charlotte, Char, Fuller has been with the Department of Marine and Coastal Sciences for over 20 years. In that time, she has developed into a dedicated and multi-faceted technician who runs the communal departmental facilities so smoothly and makes these facilities so optimally available that her expertise and competence are often overlooked. But not today. She has overseen the facilities in an aging building through a number of upgrades for new faculty hires, supervised numerous and all-to-frequent repairs to the heating and plumbing infrastructure, and managed annual inspections with minimal and usually unnoticed disruption to the ongoing scientific and educational activities. She has effectively supported departmental research pursuits by knowing not only what is important scientifically but also what can be done practically within the regulations. And, notably, she has done this with a humility and a grace that makes her universally respected. For her long and enormously competent years of service, we are pleased to honor her with a 2017 Staff Excellence Award. Some of the 36 members who were awarded the Team Excellence Award. L to R Radha Jagannathan, Rick Ludescher, Michael J. Camasso, Christopher Warren, Jessica Varela, and Rachel Repez. With 36 participants, including faculty and staff from the School of Arts and Sciences, the Bloustein School, the School of Nursing and three departments at our School, the director of the Rutgers Gardens, AND instructors and students from the New Brunswick High School and the New Brunswick Health Sciences High School, the Nurture thru Nature program is truly a team effort. Under the able leadership of Michael Camasso and Radha Jagannathan, Nurture thru Nature addresses the formidable challenge of preparing a diverse group of students for success in scientific and technical fields. In 2009 NtN began delivering an innovative, interdisciplinary after-school and summer science program to 17 4th graders at Paul Robeson School in New Brunswick. Today the program reaches 120 students each year from eight elementary, middle, and high schools in New Brunswick through a comprehensive curriculum of classroom labs, structured field trips, individual and group science projects, science and math tutorials and naturescape designs. 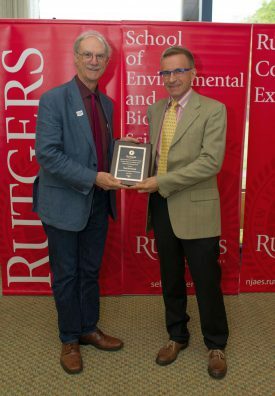 The program is unique in New Jersey in structuring its outreach within a classical experimental research design which enables rigorous evaluation of program efficacy. The program organizers thus know that NtN students exhibit higher language arts, science and math grades and do significantly better on science knowledge assessments. 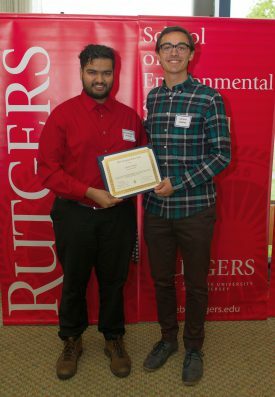 For demonstrably improving the educational performance of hundreds of New Brunswick students and assessing their impact through appropriate methods, we are deeply honored to award the Nurture thru Nature program with the 2017 Team Excellence Award. There are many reasons to be proud of the long history and traditions of excellence at the School and the Experiment Station. The honors and service Fraternity of Alpha Zeta is one of the most important reasons. The George H. Cook chapter was founded in 1922, in only the second year of the New Jersey College of Agriculture. Since then, the brothers of the Fraternity of Alpha Zeta, for many years now including women as well as men, have represented the best and the brightest examples of what it means to be a successful and involved undergraduate at our School. Each year students in Alpha Zeta honor select individuals for their contributions to our academic community. This year’s winners will be introduced by Pushpadantgiri Goswami. Theodora Mavros with her Freshman Award. Dana Tsuchida with her Sophomore Award. Samuel Coakley with his Junior Award. 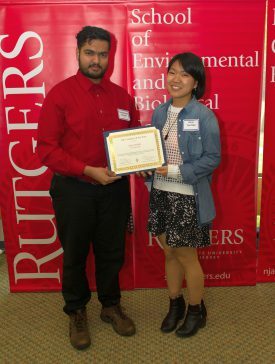 Alpha Zeta’s Student of the Year Awards went to: Theodora Mavros, Freshman Award; Dana Tsuchida, Sophomore Award; Samuel Coakley, Junior Award; and Vandana Apte, Senior Award.